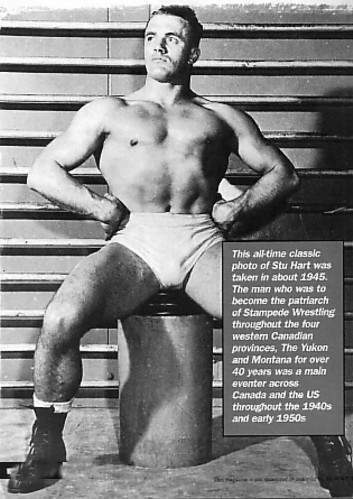 Stu Hart had dreams of winning an Olympic medel in amature wrestling, but wasn’t able to participate due to World War II..
Stu Hart played football for the Edmonton Eskimos of the Canadian Football League..
Stu Hart is the patriarch of the world famous Hart Wrestling Family..
Stu and his wife Helen had 12 children; Smith, Bruce, Keith, Wayne, Dean, Ellie, Georgia, Bret, Allison, Ross, Diana & Owen..
Stu Hart wrestled from the 1940s into the 60s, with occasional appearances as a wrestler in Calgary in the 70s..
1948: Stu Hart began his own wrestling promotion in Edmonton, which eventually moved to Calgary in the late 50s..
Stu Hart is responsible for training some of the greatest wrestling talant out of what was known as “The Dungeon”..
~~~Such as: Chris Jericho, Chris Benoit, Test, Edge, Christian, Bret, Owen, Kieth, Bruce are just a few..
1986: Stu Hart actually made an appearance at age 70, wrestling with son, Keith, against Wayne Farris (Honky Tonk Man) & JR Foley..
December 1995: Stu Hart’s 80th birthday was celebrated with a special “Night to Remember” event at the Stampede Corral..
~~~In attendance were Ed Whalen, Dan Kroffat, Angelo Mosca, Leo Burke, the Hart Brothers and Dory Funk Jr. and Terry Funk..
May 31, 2001: Stu Hart is invested into the Order Of Canada by Governor General Adrienne Clarkson during a ceremony in Ottawa..
2001: Stu Hart lost his wife, Helen, after 53 years of marriage..
2002: Stu Hart is hospitalized with the same respiratory problem he had a year or so ago — not considered serious..
October 3, 2003: The Toronto sun reported that Stu Hart, 88, has been hospitalized after suffering injuries from a fall..
~~~Stu Hart is expected to remain in hospital because he may have a staph infection and intestinal problems..
October 16, 2003: Stu Hart passes away at 2:25 p.m from complications of diabetes and pneumonia at the age of 88..
October 19, 2003 – No Mercy: Chris Benoit defeated A-Train with the Sharpshooter as a tribute to the recently deseased Stu Hart..
October 23, 2003: Stu Hart’s funeral is attended by the Hart Family, Ralph Klien, Jim Ross, Vince McMahon and hundreds of others..
Mike Aldren wrote (May 2010): The former Hart family home is currently listed on the Calgary real estate market for $4.95 million, after being refurbished, with “The Dungeon” basement still intact. This news has surprised people close to the family as they were under the impression the basement had largely been dismantled. The mansion, located in the Patterson Heights neighbourhood of Calgary, was built in 1902 by businessman Edward Crandell. It was converted into the Soldiers’ Children’s Home for Orphans in 1920 and later sold to a lawmaker called Henry Stuart Patterson. Stu Hart purchased the mansion for $25,000 in 1951, where he raised his family and trained many professional wrestlers over the years. Famous Dungeon graduates include Superstar Billy Graham, Greg Valentine, Bad News Allen, Davey Boy Smith, Brian Pillman, Jushin Liger, Ricky Fuji, and Chris Benoit. The mansion was sold by Stu’s children to local businessman Dario Berloni for $1.5 million in 2004, a little over a year after Stu passed away. It was in need of extensive restoration and held high property taxes, which the family could not afford. Stu had also instructed in his will that his family not tear it down. Prior to the sale, there was talk of turning the mansion into a museum or bed and breakfast; however, this would have required zoning changes further diminishing the chances securing protected status. In June 2006, preservation plans were defused in a tied 7-7 city vote, leaving it susceptible to demolition. Later that year a revised plan was authorized for thirteen townhouses to be built around the mansion as well as its restoration. Construction was slated to begin in summer 2007, but those plans were never implemented. The mansion is now listed on property guides as 5,600-square-foot, on 2.17 acres of land, with twenty-two rooms, including six bedrooms with en-suites, two porches, a view of downtown Calgary, and a coach house behind the main house. Realtor Donna Rooney says the mansion has been fully renovated. “The amount of money that has gone into this and the love that’s gone into this renovation has been spectacular. Anybody that’s seen the house is just in awe,” she told the Calgary Herald. “It’s beautiful. There’s been a lot of imported tile and wood and the kitchen is totally divine. The house is gorgeous. It’s very much a grand property.” Ross Hart was also quoted in the Herald article as saying he hoped that developers wouldn’t purchase the mansion and build townhouses or condos on the land. Frank Earl wrote: Stu Hart once owned a light aircraft, a Piper Comanche. One wintery Saturday night, the wrestling was in Edmonton, 200 miles from Calgary. The roads were bad, according to the weather reports, so Stu decided to fly. With four wrestlers and their bags on board, the plane was a little heavier than it should have been. Stu put less fuel in the tank to compensate. The weather in Calgary was clear, but as the little plane gained height, and was a few miles out of Calgary, it ran into clouds of freezing fog. The fog formed ice on the wings, and the plane increased in weight. Stu tried to fly above the fog, but that just made it worse. Tipping the wings left and right did not work either. Soon,the plane was losing height, and its engine had to work twice as hard to stay airborne. The ice on the wings was getting thicker and thicker, and the plane was flying really low. Dismayed, Stu looked at the gage and saw that the straining engine had used most of its fuel. By then, still fifty miles from Edmonton,things did not look good. Unable to stay in the air, it was decided to find a landing spot, perhaps a road which had been ploughed, or a flat part of the prairie. At the engines last gasp, a flat area stretched out in front of the plane. The Piper was travelling fairly slowly by now, and so close to the ground that there were branches hanging from the landing wheels. A satisfactory landing took place, and a nearby householder let us use his phone to ring for someone to pick us up and take us to Edmonton. (There were no mobile phones in those days). We discovered later that our landing strip was actually a frozen lake.